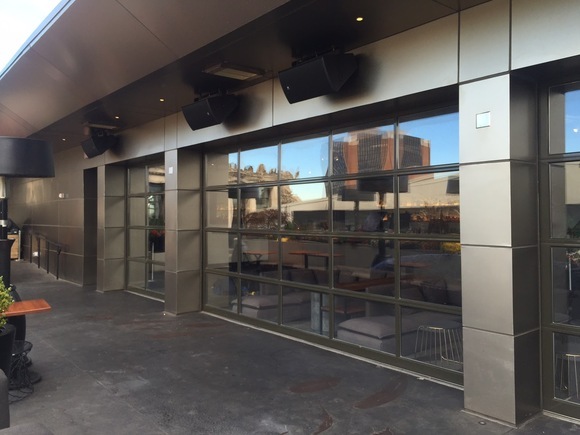 PHILADELPHIA—HARMAN Professional Solutions recently provided a significant sound and lighting upgrade to the Stratus rooftop lounge. The technology overhaul included JBL loudspeakers, Crown amplifiers, BSS controllers and Martin fixtures. In the heart of Philadelphia's Historic District near Independence Hall sits the equally historic Lafayette Building, home of the prestigious Monaco Philadelphia boutique hotel. And sitting atop the hotel, floating 11 stories above the country’s most historic square mile, is the newly renovated Stratus rooftop lounge. According to Hoffer, when the Monaco Philadelphia Hotel opened three years ago, the Stratus lounge and its outdoor pavilions were equipped with just basic sound and lighting system support, based on a simple 70-volt, in-ceiling system that needed replacing. The system covered announcements and background music, but offered no zone or room-to-room control, and no entertainment lighting. Management’s plan was to get the hotel launched, and then through a second phase, come back and focus on the sound and lighting system needs of the lounge, with the goal of turning the Stratus into an entertainment attraction. With available space at a premium and aesthetics a prime concern, Hoffer and his team installed a mix of JBL AC-28 and AC-16 loudspeakers within the interior spaces, supported by a set of JBL ASB6115 and JBL ASB-6112 subwoofers. The large exterior space utilized the JBL AM-7212 loudspeakers and JBL ASB-6115 WRX subwoofers. Because of the close proximity to rooms and other less party-focused guest areas, hotel management had a concern about bleed-over vibration. Aurora Sound and Light took an innovative approach to the solution by mounting the exterior subwoofers on a spring system, similar to what might be found with AC units. The subwoofers ride on springs, isolating them from the building, providing a pleasant aural experience for all guests. For nightclubs and entertainment spaces, lighting is a prime component for creating the right atmosphere. Across the four spaces, Hoffer and his team placed more than 30 Martin Exterior 50 LED lights. These super rugged, compact, indoor/outdoor fixtures were a perfect lighting solution for the lounge and its pavilions. Similar to the sound system, the lighting system has been completely updated and modernized and is now based on nicely organized zones, with digital controllers and room scene presets in place, all under password protection. Hoffer noted that the most challenging part of the lighting system was to get updated wiring and control in place for the Martin 50 LED systems. In many spots, there may have been power, but no data. Hoffer and his team pulled Cat5 where they could, made use of some existing cabling, and even went wireless for a key focal point within an outdoor pavilion. “The BLU link and Crown amps greatly simplified the installation. Ultimately, we were able to run three Cat5e cables to network the system, rather than 30 analog cables. This not only saves a huge amount of time and money during the installation, but adds a high level of flexibility and scalability for future changes or additions,” said Hoffer. Hoffer noted that the synchronicity between HARMAN Professional Solutions products is a big reason he so frequently relies on a comprehensive HARMAN audio system. In mid-October 2015, the Stratus Lounge hosted a grand re-opening party with a popular DJ and a great deal of fanfare and positive reviews. With the ability to host about 300 people across all four venues, the Stratus Lounge is now fast on its way to re-branding itself as an exciting, private event and destination nightspot.